Yay - it's Halloween Challenge day again. I've really begun to look forward to these posts, and today's is no exception. 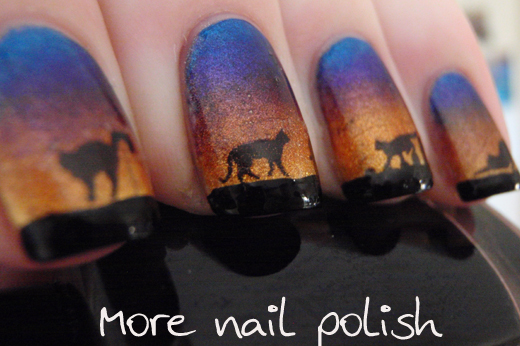 For today's gradient theme I chose to do a sunset colour combination with black silhouetted cats. I started with a base of Ulta3 Lily white to get a nice blank canvas to work with. I then used Kleancolor polishes to create the gradient, Metallic Sapphire, Metallic Purple, Metallic Mango and Metallic Yellow. 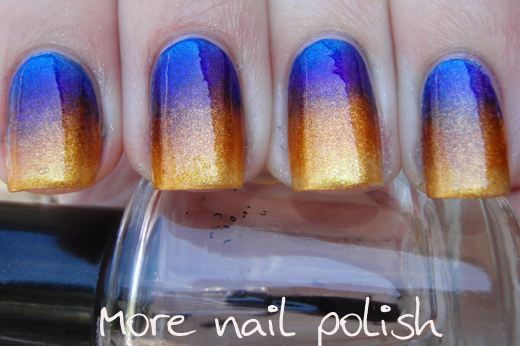 To create my gradients, I paint my polish directly onto the makeup sponge in small lines. 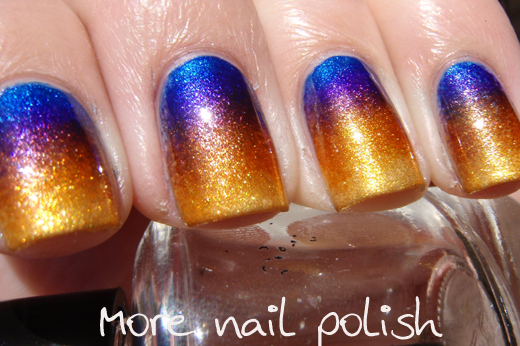 I then dab that on my nail and do two nails with the polish on the sponge. I work my way through my nails doing two at at time. When I do the second coat, I dab the sponge onto the second finger first and then back onto the first finger, that way they get an even amount of polish. I cheated for the cats and made some home made water decals. The black ink on my printer is a little transparent and I probably should have gone over the ink with a black marker to get it blacker, but never mind, I still love the effect and LOVE the kitties on my nails. 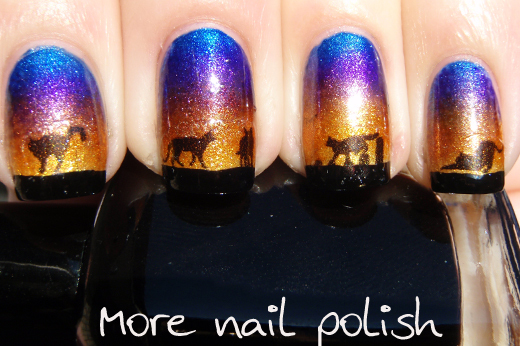 Here is what my gradient looked like before I added the black cats. 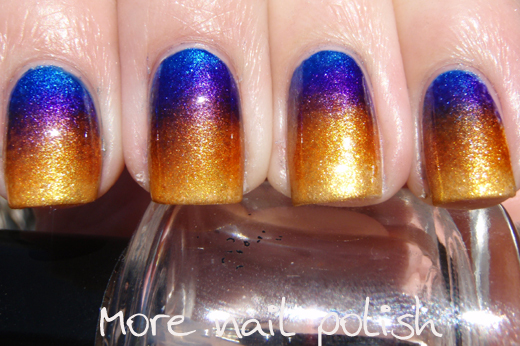 Such a beautiful gradient! I love the colours & the kitties are so cute! I'm so jealous of your decal technology :p I might have to get onto that! Very pretty! 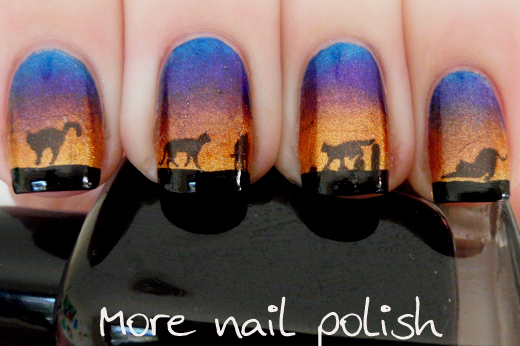 I love the kitties :) I love when you do the water decals, it always looks so cool, I will have to try them some time myself. Wow, that is a stunning set of colors, and beautifully done! This is soooo beautiful!!! I have to re-create this...awesome job!!! WOW!!! Those nails are so beautiful and so cool at the same time. That looks so cool! I hope I can get my gradients looking like that with more practice! Wow this is awesome! wow!! OMG!! This is so gorgeous!! 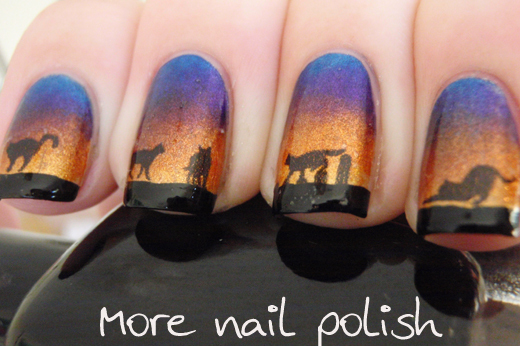 One of the most amazing manicures I've ever seen! Love cats! The gradient is sooo beautiful. I like it! Awwww I love the kitties!